Natural History. Many mosquitoes lay their eggs in small bodies of water, where larvae develop. These container habitats include: water-filled treeholes, water that accumulates predictably in a variety of plants (e.g. pitcher plants, bamboo shoots, bromeliads, and leaf axils within some plants), snail shells, crab holes, and various habitats of human origin (tires, flower pots, cemetery urns, rain gutters and downspouts). We focus on larvae occupying treeholes and tires. 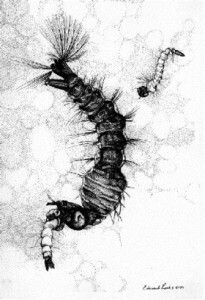 Treehole habitats are occupied by a variety of insects, including a guild of filter-feeding and browsing larval forms of Ochlerotatus, Anopheles and Orthopodomyia mosquitoes, shown here. The filter-feeders consume bacteria, fungi and protozoans, and detritus. Some of these moquitoes have preferences for treeholes in particular locations on trees, or with particular characteristics of fluid and structure. In discarded tires found in forested situations in the Northeast, the community is similar to the treehole community, except that Anopheles and Orthopodomyia are not usually present, and Culex larvae are more common. In the Southeastern U.S., and sometimes as far north as southern New England, treehole and tire communities are also occupied by the obgligate predatory mosquito, Toxorhynchites rutilus. These mosquitoes, which do not bite as adults, prey on many larvae of other mosquito species, and are also cannibals. 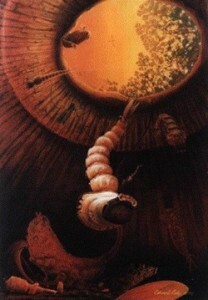 Click on the images for enlarged views of this painting of a treehole habitat with the organisms identified (below) or the pen and ink drawing of Toxorhynchites predation by Edward Rooks (right, ©1989). To watch movies of predators (Toxorhynchites and fishfly larvae) and their mosquito victims, click here. Click Image to Identify the organisms.